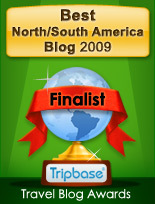 Even though I am back in the US, I still follow some of the blogs written by my online friends in Mexico. One of my favorites is written by John Calypso, who lives in Xico, near Xalapa. It happens that Kelly and I had a great time in Xico, a year or two before we settled by Lake Chapala. John’s blog is always long and thoughtful. Here is a December 2010 post called Held Hostage 26 Hours in Mexico. Okay, he wasn’t personally held hostage… exactly… read it for a tale of modern Mexico!